Formed in 2013, since its inception the Interest Group on Agricultural Data (IGAD) has grown in community strength to over 200 members. 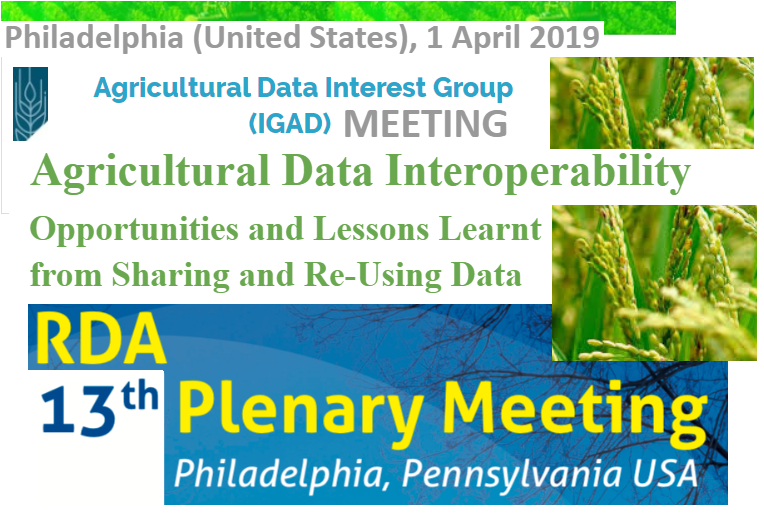 IGAD is a domain-oriented group working on all issues related to global agriculture data. It represents stakeholders in managing data for agricultural research and innovation, including producing, aggregating and consuming data. IGAD is also a forum for sharing experience and providing visibility to research and work in agricultural data. Following the successful IGAD pre-event to the RDA Plenary12th in Gaborone on Data Collection: State of the Art, Challenges and Solutions, the IGAD RDA P13th meeting will focus on the next related topic Agricultural Data Interoperability: Opportunities and Lessons Learnt from Sharing and Re-Using Data. Contributions from agricultural open data projects and initiatives to support new analyses, modeling, or decision support tools are welcome! Discussion can involve both policy and technical aspects of agricultural data interoperability. You are invited to send an e-mail to AIMS@FAO.ORG (Subject: IGAD RDA pre-meeting 2019/1) with the TITLE and brief ABSTRACT of your contribution before 22 February 2019. RDA FRAMEWORK: WHAT MAKES IT SO SPECIAL?